Version 1.1 was completed a couple weeks ago; it added a few features that many doubted would ever arrive to Exiled Kingdoms, but here they are! This is a list of what was added. Mage class: finally it happened! And I think it ended up a very fun and balanced class to play, with more build variety than previous classes. Adding the mage was hard work, with 20 new skills added to the game, over 120 specific items, trainers, etc. but it was really worth it, EK would have felt incomplete without it. New Areas: the Kingdom of Thuram was added, including two new cities and 4 new map sectors; new challenging high level dungeons were also added, in particular the Icemist sewers and underlevels. PC release: after many months of working on changes to the UI and input, Exiled Kingdoms was released on Steam! It has been a big success, with many thousands of copies sold in the first week. Localization: The game was fully translated (or nearly) to three extra languages: Portuguese, Russian and German. Thanks to the translation team for their huge effort! Other improvements: Many new features were implemented, like increasing skill slots to 8, improving input reactivity, the new world map, new text fonts, and many others. Post subject: Re: Features for Version 1.1. The adventure continues! A new update was released to testers, it includes many needed fixes and adjustments for update 1.0. Also, I just added crafting to the list of features to be be added after 1.0. Still months away, but it's coming. This will need a lot of testing, so I count on you all when it's ready. Out of the 8 skills above, 4 are already functional (a few visual effects still missing). Already 25 new items added to the game. 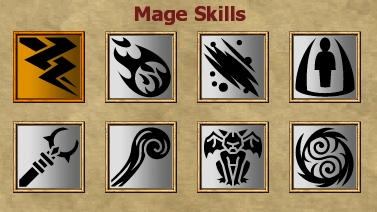 My intention is to make a release only for testers, with the mage featuring only the 8 basic skills and itemization up to level 8-9 (no guild nor advanced skills yet). Then, while this is tested for a few weeks, I'll work on several new areas for an update. All 8 basic Mage skills working, but the balance still needs a lot of work. For the next week I'll keep working on balancing and fixing issues, plus adding itemization for all the early levels. I'm not sure if I'll have time to add content too. Once it's ready I'll release a test update; very likely I won't make a public release until there's also advanced skills and itemization up to the endgame, but having testers trying out the mage at different stages until then will be good. Remember you'll get no testing update until I release it, which hasn't happened yet. Probably in a week or so. A detailed list will be provided when the update is out. Mage class, with 8 new basic skills and 12 new advanced skills. New areas in Thuram, including Icemist. Testers will get an update with the new content around Dec 14. The update will be released to the public around Dec 20th. There can be delays to these dates. I am afraid I can't reply to emails or PMs about next update. This is all the information I can disclose for now, when there's more it'll be posted here or in Facebook. Thanks for your patience and understanding. A few bugs and issues (and a new quest I decided to add) are keeping me behind schedule. It's unlikely that the test update gets released before Monday 18. Still working hard to release as soon as possible. Since past week, testers already have everything except the last quest and dungeon, which I expect to deliver in 24-48h. This quest includes the hardest content in the game by far, meant to be a challenge for those that already completed everything else. At the same time I upload this test update I'll open new tester slots and announce it here. 2-3 days after that (Should be about Christmas day) the update will be released to the public. All of this could be delayed if I run into unexpected issues, but at this point I don't think there will be any more delays. There's a small catch for iOS users. Apple reviews every app manually, and because of the holidays they are taking much longer than expected to approve submissions. It's very likely that the iOS version release will have an extra delay of a week or more.